Things are looking rosy in Paul Lambert’s garden at the moment. Christian Benteke has signed a new and improved deal with the club until 2017, Darren Bent has signaled his intention to leave the club imminently, Alan Hutton has taken his bucket and spade to Mallorca, and Barry Bannan is looking to re-start his career with Blackburn. The Aston Villa squad has gradually taken shape week-by-week during preseason, with more departures and arrivals expected, as Lambert works closely with Paul Faulkner to build and fine-tune a squad ready for the 2013 / 2014 season. In an effort to maintain a shred of dignity, the ‘bomb squad‘ appear to be in a hurry to sort out their futures and avoid being the last senior player left training with the academy. That is, aside from Stephen Ireland who, despite being handed a generous free transfer away from the club, appears no closer to finding any suitors for his services. The Villa boss had no time to worry about players being shirty about their shirt numbers this week however as he took the first team squad to Crewe for the latest pre season friendly. Having acted decisively at the beginning of the summer, Lambert’s new youthful signings have enjoyed an extended period of time to adjust, make mistakes, and gel with the rest of the squad. Patchy performances at this stage of the summer are to be expected and the longer the new signings train together, the quicker the team will settle down. In all the preseason games so far, it has been encouraging to see Villa maintain their pass-and-move style which was gradually developed throughout last season’s nail-biting campaign. Villa have been working hard on what the late, great Sir Bobby Robson would call, ‘carpet football‘ and the architects of many of these moves are Lowton and Westwood, who have developed a great understanding on the right side of the pitch as they frequently play around teams with one and two touch football. 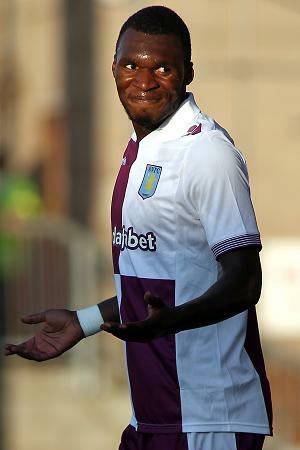 Benteke’s second goal of the match against Crewe followed a really pleasing team move and the assist, an extravagant flick by Karim El Ahmadi, was not something fans would normally have expected from a player who looked a little robotic at times last season. El Ahmadi has been released from the shackles of defensive midfield, which ultimately he didn’t master in the Premier League, and the Moroccan midfielder may therefore be a useful under-study to Westwood in the deep-lying play maker role as Lambert looks to finalise his midfield squad positions. Less pleasing for Lambert in preseason has been the performances of centre-backs Ron Vlaar and Ciaran Clark. Both have made errors which have led to goals and the errors have been made for a variety of reasons. As a partnership, Clark and Vlaar are not commanding enough in the air from set pieces. Both players, in my opinion, would prefer to play with a more commanding partner since their skill lies in making tackles on the floor and bringing the ball out of defence. Okore and Baker are more committed in the air, as their frequent head injuries would testify, and Paul Lambert may need to experiment a little more to find the most effective centre-back combination in the remaining preseason games. A potential problem for Lambert is that this is World Cup year and Villa’s Captain, Ron Vlaar, may not enjoy spending any time on the bench. ‘Concrete‘ Ron made a frank admission to the Birmingham Mail recently, when he admitted that he must improve his own game following a series of under-par performances last year. On the flip side, Vlaar also knows that he must play out of his boots this season to stand any chance of making the trip to Brazil with the Oranje. In the match against Sunderland where Villa thumped Sunderland 6 -1, Vlaar ducked out of headed clearance when the match was finely poised. Vlaar’s indecisiveness on that occasion was enough to make Brad Guzan give him a Walter-Tango-Foxtrot glare of disgust. Again, in the match against Wigan, Vlaar did not have the best of games and both of these performances were slightly glossed by the fact that Vlaar got on the score sheet. Ciaran Clark is still having some technical issues with his game and whilst he has improved the habit of getting tight to opponents, he has been positionally suspect from corners in recent games. Paul Lambert gave Clark his vote of confidence with a new contract last week, so obviously sees the potential in Clark and will be hoping that the former academy player can develop his game this season with help from himself and Ian Culverhouse. Luckily for Ciaran Clark he has time. Clark is three years younger than David Luiz, and a much maligned Luiz himself improved his game dramatically under the tutelage of Rafa Benetiz last season. Another problem for Vlaar and Clark has been the fact that Luna and Lowton are often playing very high up the pitch, with Luna sometimes the furthest attacking player forward against Crewe. For the system to work, a central midfielder (ideally a defensive midfielder) needs to drop back centrally so that the other two centre-backs can form a back three in transition. Vlaar would then move to right centre-back and Clark to left centre-back to cover the space left by the advanced full-backs. At the moment, the communication and positioning hasn’t quite worked and the centre-backs are either dragged too wide apart with a gaping hole between them, or they stay close together and teams exploit the wide areas. Aston Villa are not the only team to have faced difficulties when playing two attacking full-backs, as Barcelona suffered similar problems last season when opposition teams exploited the space left behind Dani Alves and Jordi Alba. Paul Lambert will need to continue to work with his youngsters to close down spaces better defensively, a problem which Villa also failed to address properly last season, but on the whole the team are progressing nicely and putting into practice the style of play desired by the manager. Good article, I like Vlaar but I feel in order for this team to get better we should replace him, I believe after his own admission that he was not good enough shows to me either A he knows he wont get any better or B he does not see his long term future at VP. Ideally we would see Okore paired with Baker/Clark and rotate when necessary. I still see us signing a creative midfielder and defensive midfielder, I don’t feel PL see’s Herd as the cover for Sylla but more as RB cover Lowton. I’m seriously concerned about our defence. Okore may turn out to be the answer, but at the moment, Baker is the only central defender on the books I have any confidence in – and he is reckless at times. Clark is better in midfield where the odd lapse in concentration or niggly foul can be covered by other players. Vlaar is no hardman, despite his reputation. I doubt we will make any more moves in the transfer market, but would have liked us to have brought in an older centre back to compete with Vlaar for his place (Baker and Okore to duke it out for the other). CraigWright Can’t see them buying any more defenders. MyOldManSaid CraigWright Me neither, which is why I’m concerned. Vlaar needs to up his game dramatically. CraigWright totally agree mate…..Baker will become a top class CH but too often Vlaar is negligent of his duties, as for Clark, you are right, he is better suited to midfield. Excellent analysis. Our defensive frailties on the wings was one of the reasons I was disappointed we didn’t renew Lichaj’s contract. He would have been the ideal backup for Lowton being as defensively adept as he is. Lichaj did well every time he featured at right back last season but his cameos at left-back harmed his reputation. I’m sure it was his above average wages that did him in. I would be surprised if Lambert didn’t try 3 centre-backs again this season. I think it will work much better with a more experienced squad. As for the deep-lying midfielder role you mentioned I think Chris Herd was made for that position. clbick3 Herd obviously still has a role to play, as Lambert has chosen to keep him. I thought it was borderline whether he’d be cast adrift. Needs to live up to his earlier rep. I’m sure he’ll have his chances to prove himself in the new season.